Click here for a natural color image. IC 443, the Jellyfish Nebula, is a Galactic supernova remnant, in the constellation Gemini, that occurred 8,000 years ago. It is one of the best studied cases of supernova remnants, interacting with surrounding molecular clouds. 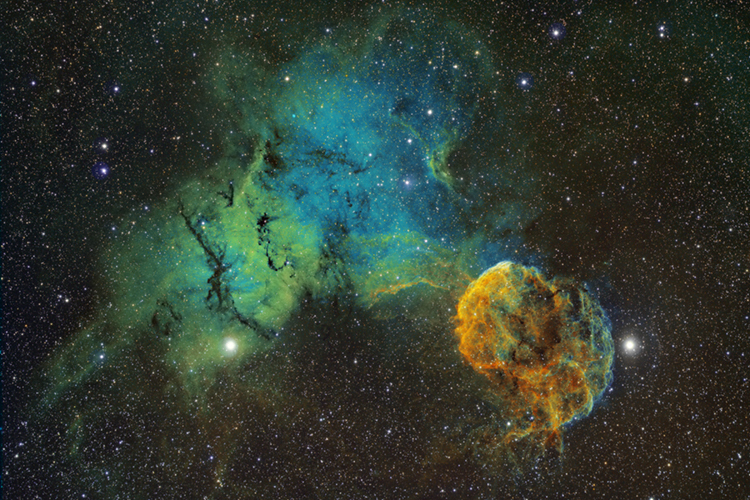 IC 443 spans about 65 light-years at an estimated distance of 5,000 light-years. The large expanse, to the left and to the top of the image, is the emission nebula Sh2-249... at a distance of 5200 light years. Roll your mouse over the image to see the location of the emission and/or reflection nebula IC 444 and the recently discovered HoCr-1 planetary nebula. HoCr-1 (Howell-Crisp 1) was discovered by amateur astronomers Michael Howell and Richard Crisp in 2006.